my name's peaches, i go by peachy, peach, and whatever else. 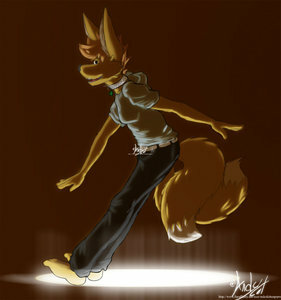 i'm a fennec fox with two tails, just like my best friend tails :3 i love sonic a lot a lot <3 i'm a boy and i like boys. i also love music (guitar/piano/electronic) and comedy. i love to laugh and i love to dance. most of the music i like is pop, and if that bugs you, sorry :P i certainly can appreciate the value of alternative, folk, jazz and other genres...but somethin about that 808 makes me want to shake my booty :/ i don't know what to tell ya. i was born on Mobius, not Earth, but can speak English with excellence, somehow :P i consider my character immortal/ageless, sort of like Mew (the pokemon). however, i don't remember all the details... i just know that when i hit the keys on that piano, i feel a huge sense of solace.